My friend Jim F suggested I write something about cooking a new recipe. As it happens, I recently tried a new recipe. See, one of my favorite things to do in the kitchen is to try to recreate some of my most favorite restaurant meals. After all, while I love eating out, it gets kind of pricey, especially if the food is good. I never look at those websites that illegally post the ingredients or anything like that. I just sort of take my best guess and see if it ends up anywhere near as good as the original. 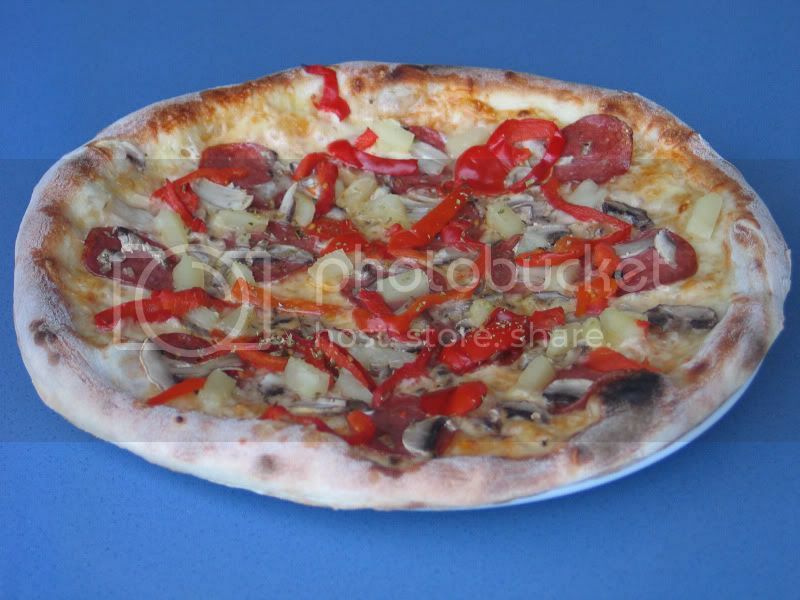 In this particular case, I was trying to recreate this ridiculously good pita pizza that a local restaurant makes. I looked at their menu to see the description. A vegetarian chili, tahini sauce, cheddar cheese, on their special pita bread. It seemed pretty doable. Of course I had no idea what ingredients were in their chili, but I figured I’d experiment and see what I could come up with. As it happened, I ended up with something that was darned delicious. Maybe not a whole lot like the original. Maybe not even as good. But still entirely satisfactory to me and my taste buds. And that’s where the lesson about blogging comes in. A lot of bloggers give away a lot of information about how to succeed, just like my local restaurant gives away, it seems, all of the ingredients that go on to that delicious pita pizza. But there’s a big piece missing from the puzzle. What goes in that darned chili mixture? What’s the secret to the whole recipe? That is what you have to guess at, and truthfully, you’ll probably never recreate that special sauce 100%. I think a lot of new bloggers spend a lot of time trying to do just that – they try to recreate that special something that seems so obvious on other blogs but eludes you when you try to grasp it. I know I did that when I first started. I would scan blog sites I adored like Stan’s PushingSocial.com or ChrisBrogan.com or ProBlogger or CopyBlogger. What is that magic they have going on? What makes blogs like Danny Brown’s and Mark Schaefer’s so darned successful, and how can I do that? I’ll bet you’ve had thoughts like that before. Well, here’s the thing. Everybody’s secret sauce is different. It might seem like there’s an echo chamber (maybe there is). It might seem like everyone starts with the same building blocks (maybe we do). But there’s something different that everyone puts into his or her blog, and that’s what makes it theirs. What I found out when I made my own version of the pita pizza is that there are a lot of different kinds of organic canned chili sauces out there, and they all taste great with sesame tahini sauce. None of them, certainly, are what my restaurant uses, but they all work for me. They are my own secret ingredients I used to make the pizzas my own. For my blog, I decided to just start writing the way I would if I was sitting down talking to you. I happen to infuse a lot of movie and song references into my talking, so now you get ’em on this site. My secret sauce, I guess you could say, is me. For other people, it’s the ability to get readers to act. For still other bloggers, it’s their ability to incite all-out warfare. We’re all making pita pizzas, but they’re all different. So my question to you is simple and yet completely difficult. What are you doing to cook up your blog? Are you trying to recreate something that already exists? Are you completely off the map? Are you trying different things like I tried different kinds of chili? Thanks for taking my idea to the next level. You are a wonderful and inspiring writer and your “recipe for success” in blogging is absolutely what I needed this morning. I’ve got a few things in the oven right now and as a result of reading this I’m going to make sure I put my “Fierce” spin on it and crank out some food for thought that is yummy and speaks to others through my voice. Keep up the great work and I can’t wait to see the rest of the brilliant posts you “cook” up this month!! I love the analogy between cooking and blogging and the idea of “secret sauce.” I know that my secret sauce is me. It doesn’t matter what writing style or person I decide to use in a particular post – the element of “me” still remains. Well said, Erin. Thank you! What an unbelievable analogy! That’s what I love about yours, Stan’s, and Danny’s blogs. You all tackle topics with a conversational, easy to understand, and personable tone that makes it fantastic. I hear the terms awesomesauce and secret sauce all the time and i understood what it meant, but this really drove it home. It clicked! Now I just need to learn how to cook. THAT is not going to be easy. I still manage to toast my cereal somehow, LOL! Excellent post as always! Interestingly, everyone’s secret sauce is themselves but it takes sometime to even find what makes the me-sauce. Just like Brandon, I think I’m toasting my cereals too! Haha..